Thurlow Fisher Lawyers team of Michael Coxon, Aaron Links and Trent Barnabas became the 2011-2012 NSW 18ft Skiff champions when they finished with a total of five points after coming home second in today’s last race of the series on Sydney Harbour. 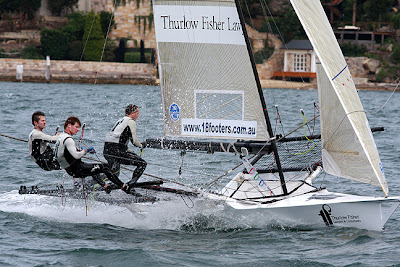 While Thurlow Fisher took out the championship, today’s race was a one-boat affair as Gotta Love It 7 (Seve Jarvin, Sam Newton and Scott Babbage) gave an awesome performance throughout the North-East course to score a brilliant 4m4s win over Thurlow Fisher. 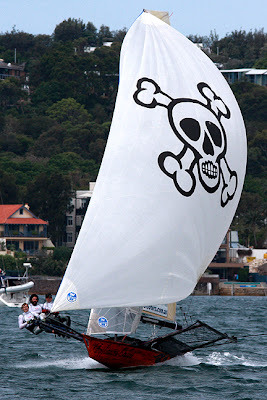 Two earlier disappointing placings for the ‘7’ team saw them finish third overall on 15 points, behind Lumix (Jonathan Whitty, Greg Dixon and James Hozack), which was runner-up to Thurlow Fisher on 10 points. 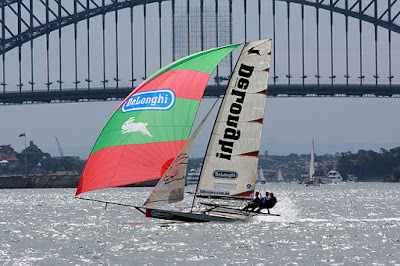 Third placing today went to Appliancesonline.com.au (Micah Lane, Paul Montague and Tom Anderson), which finished 55s behind Thurlow Fisher. Fourth place overall in the championship went to Smeg (Nick Press) on 15 points, followed by Rag & Famish Hotel (Jack Macartney) on 25 and Appliancesonline.com.au on 26 points. 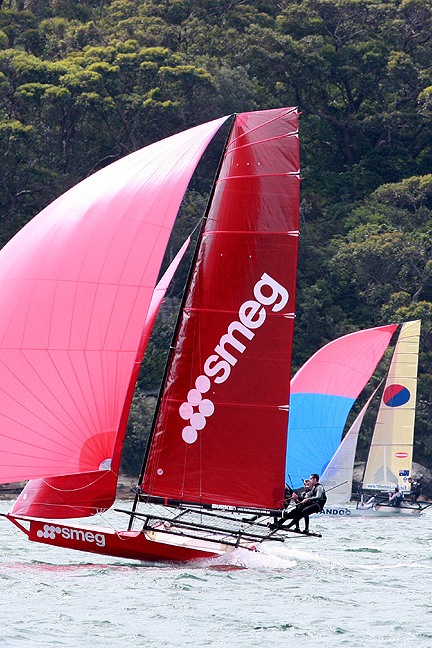 Most of the fleet chose to use their smaller #2 rigs today with only Smeg and Mojo Wines (Archie Massey) deciding to go with the bigger #1 rigs. Right from the start, Gotta Love It 7 dominated the race with only Appliancesonline.com.au able to go anywhere near the red flyer. 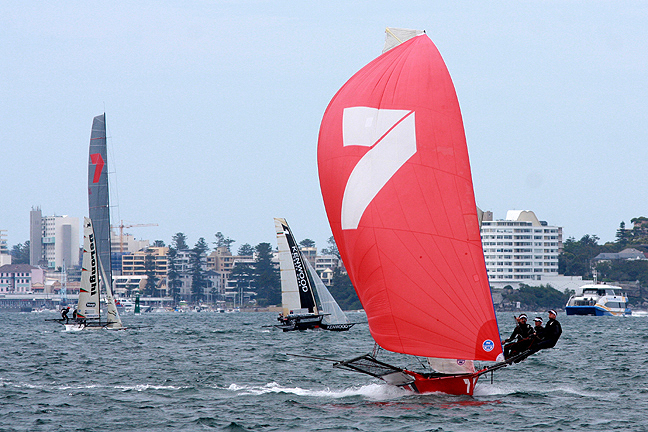 At the windward (Beashel Buoy) mark, ‘7’ had already established a lead of more than one minute over Appliancesonline, with Rag & Famish Hotel third and Thurlow Fisher Lawyers fourth. The lead was extended to 1½ minutes at the bottom mark to complete the first lap. While the lead may not have been contested, the race for the next six placings was intense with little between Appliancesonline.com.au, Rag & Famish Hotel, Thurlow Fisher Lawyers, Lumix, Smeg and Yandoo, which was again being sailed by John Winning Jr., who was replacing his injured father. 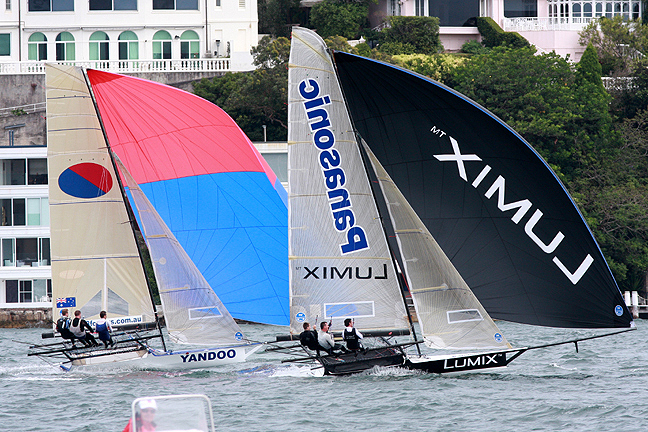 7’s lead was out to 2½ minutes at the following windward mark and from that point the race for victory was all but over, and it was left to the race for the following six places to keep the spectator fleet’s interest alive.